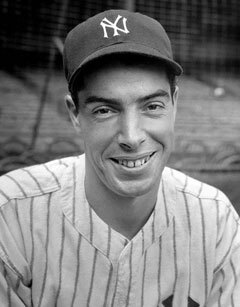 a stitch in dye: Where have you gone, Joe DiMaggio? I don't know where Joltin' Joe is (let's say heaven, ok? ), but I sure know where I've been...and that's not been here. Life has kept me from you. Life and all the changes that have been a part of my life over the past year or so. Many of these changes or opportunities have been amazing blessings. Everything from releasing my first fabric collection to designing a second, being included in numerous books and articles, teaching both near and far, and soon, very soon, you'll see me on Craftsy.com leading you through all the steps that I use to create my hand dyed and patterned fabrics. And that's not even it. That's just the professional stuff. In the past year I've run 8 races that were half marathon distance or above, discovered trail running(which I totally love, love), competed in my first triathlon, and swum from Alcatraz across the San Francisco Bay to the shore at Aquatics Park. I've watched my girls grow and blossom and had the joy of watching my middle one graduate from high school and, even as we speak, register for her first college classes. There have been many sweet moments over the past few moments and, considering that I'm signed up for another race this weekend, hopefully many more to come. But, and this is the reason behind my spotty presence here over the past months, much of it has been in response to the biggest life change I've ever experienced, divorce. This space hasn't exactly been confessional in the past, but, I can't guarantee that will be the case in the future. I spent 20 years pretty convinced that I had at least a clue of what tomorrow would bring and have only recently learned the true meaning of the Yiddish saying, " Mann troach, Gott lauch, " (Man plans, God laughs). But, before you flood me with sympathy, know that this too is a blessing. And, I say that not because I read it as an affirmation on Facebook, though I did, but because it's true. You don't know in which direction you'll grow or what you might try until something, and, sadly, it usually has to be something big, pushes you to rediscover who you are and what you want. By the way, another new discovery for me: I don't have who I am or what I want completely figured out and I may never and that too is a blessing. So, with that being said, what can you expect from me here over the next few months? Hmm? I'm not absolutely sure, but I think it will have to include more of me than I've let you in on before, more words, but, hopefully, not too many fewer images and, probably, a few surprises. Surprises for both of us. To celebrate that, I've changed my blog header and will probably change it again and I'm uploading a picture that was taken of me at a recent trail race. It's not a pretty picture. I'm hot and dirty and sweaty, but, when I posted it to my Facebook page, a friend commented that I look like the woman I was always meant to be. So, here it is. Here I am. 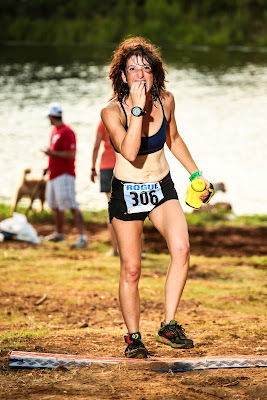 For those of you wondering, the picture was taken at a trail race at Reveille Ranch in June. I had just passed one of the aid station and was eating a sandwich. Table manners were not a big consideration at that point. In all ways you go girl! What an inspiration you are. I'm Cheryl, not anonymous so much as accountless. I just wanted to say that the woman in the picture looks strong, totally alive and ready to take on the next challenge. I am celebrating you!!! Fantabolus! Just beautiful, a picture of strength! Congratulations on going forward to find who you are and what you want, condolences on the loss of a long term relationship that was been so much a part of your life for so long. Glad you have been living life, with all of the laughs and plans and cries and also glad to see you back here! Some years ago I have red the following sign on a T-shirt - This is the first day of the rest of my life! I love it. You look truly happy in that photo, I'm sorry your relationship is at an end and I hope everything comes together for you in a positive speedy way. Wow! so now we know what you've been up to! Go for it! I love the photo - it's so full of energy and passion! I love that picture of you - raw and unadulterated. Running in a race pushes us to our limit - it forces us to dig deep and discover what we are made of. You'll never know where you begin and end, unless you explore those (scary) frontiers ... and expand beyond what you thought was your limit. 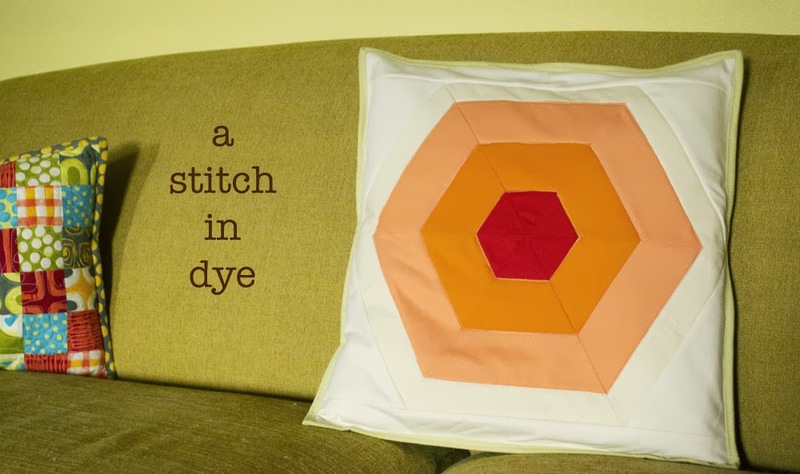 We are behind you in spirit, your sisterhood of quilters, crafters, PEOPLE! I am so happy to see you back! I was a bit concerned about your absence but I had a feeling you were doing very well, out and about and exploring. I am in total awe of your Alcatraz swim - if that isn't representative of your experience for this year, I don't know what is. Looking forward to reading more so take care- Byrd. So nice to see you here, Malka! Sounds like you have been busy living life to its fullest. You look so happy! I have been divorced a long time and looking back the one thing I needed was a support system. I pretty much went thru it alone which was hard. I just could have used someone to bounce my thoughts off of. I hope you have that support. And after all these years, I am still looking for myself! Will I ever find her? I don't know, but I am going to keep looking! You sound and look so full of energy - no doubt you are on the right track (pun intended!). Have fun on your journey, can't wait to see where it takes you next. and I love your new blog header! Great to see you, Malka. I've just discovered your blog, but I want to thank you for your words. Life taught me some years ago that nothing is to be taken for granted, you never know what will happen the next minute. Loving to live life every single minute and accepting the changes you encounter is what makes it all worth! I wish you the best of luck with everything you do and all the changes in your life. You are an inspration. Even though you have had bumps in the road, you have overcome and are now rejoicing in your acceptance that life is good and the good shows up every day in every way. I am so inspired by your post! I just decided to run my first half marathon and have been in training for three weeks. Seeing your glow at the end of your race is a fantastic motivator. I wish you strength in facing the personal challenges ahead. And thanks again for inspiring a fellow sewist to get out there and sweat. I can't run but I can quilt. I admire people (like you!) who can do both! And I have discovered that whatever bad things life throws at us, there's always something good to be found in the rubble. You just have to look for it. Wishing you well and happier times ahead. I love the photo. Even "dirty and sweaty" there's a joy in your face. It sounds like you have an awesome attitude to all the challenges you are facing. I will pray God's blessings on you and your family. Yep, divorce was a huge growth catalyst for me as well. Sad that it takes such a traumatic event to spur us to greater things, but thank goodness it does! You look strong, like a survivor. 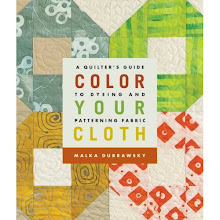 Hoping to see you at Quiltcon!!! You look just perfect in your picture! hang tough woman! Morning. It was great meeting you. Morning. Great meeting you on your blog. Wow! GREAT JOB on the race!!! You are an inspiration! pAm I in the wrong spot for your blog hop post I can't find it.